Many thought Gyalwang Karmapa Ogyen Trinley Dorje, woud be the most revered Tibetan leader next to His Holiness the Dalai Lama, but they were stunned back when Lobsang Sangay, a non-religious figure, a youth, a new face to the Tibetan community came up, and took the Dalai Lama’s position as head of the Tibetan political leader. 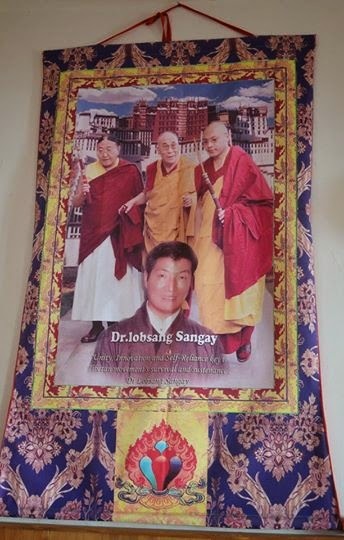 After months of touring the Tibetan settlements in India, Europe and in the United States, Lobsang Sangay had become a people’s person and he won the election in 2011 as political leader of the six million Tibetans. As he was enthroned as the new political leader-- the prime minister of Tibetan government in exile, Tibetans across the world, especially inside Tibet lionized him as “god-king” – few Tibetan pilgrims from Tibet who were at the enthrone-ceremonmy on August 8, 2011 at the courtyard of the Dalai Lama temple in Dharamshala, India surprised the world by prostrating and praying to the new non-religious figure. Soon after Lobsang Sangay took the Dalai Lama’s seat as head of the Tibetan government in exile, many singers and poets inside Tibet started composing songs, releasing albums praising the new leader, and assuring him trust and support from Tibet. Even few framed the photography of the new leader in style that only god and goddess are usaully made and sent to him showing their respect and reverance. In return what did Dr. Lobsang Sangay do? He made empty promises, gave fake hopes, and in between, we lost more than 120 Tibetans burning themselves on fire, calling for the return of the Dalai Lama from exile, and freedom in Tibet. On several occasions in U.S.A. and India, His Holiness the Dalai Lama had urged the Tibetans across the world to think “twice” before making any protest against the Chinese government saying that the protests could send “empty hopes” to the Tibetans inside Tibet, and thereby, elicit them to embrace more protests against the Chinese government which would lead to more arrest, more torture and more brutality. I think its high time for Dr. Lobsang Sangay to come down to realities, and prepare for the worst. Even after two years of his political leadership as head of the Tibetan government in exile, he couldn’t even resume the negotiation talks with the Chinese government, so how can he make the Chinese leaders come to his terms in next less than two and half years of his leadership? Before reaching to the Chinese government, and addressing the plight of people inside Tibet, our political leaders in Dharamshala first need to address the plight of Tibetans in exile. One who ignores the plight of people at his door areas will never able to address the plight of people at far distant. If they make any vows, that’s just a lie! The new Tibetan political leader often expresses his solidarity and support with the Tibetans inside Tibet, and even vowed to specifically address the hardships of Tibetans from Tibet in India. But even after more than two years of his leadership, he has not fulfilled his promises that were made to the Tibetans from Tibet. When it comes to his leadership, he has three things that he claims them as “success,” and puts to his credit. First, extension of the R.C. (Residential Certificate) to five years from one year renewalship, but Tibetans from Tibet still have to continue with the annual renewal of Residential or Refugee Certificate, unless they have been living in India for last twenty years. Second, nursing practice for the Tibetan nurses in India. In a statement, acknowledging the government of India, Ministry of External Affairs, Ministry of Health and the Indian Nursing Council for taking into consideration the status of Tibetan nurses, and deciding favourably for their employment in India, Dr. Sangay noted that he had solved the Tibetan nursing overhaul, but a statement issued by the Indian Nursing Council said only those who were born in India can work in India, so what about those Tibetans who were born in Tibet but grown up and educated in India? The plight still goes on with the Tibetan nurses in India who were born in Tibet. This is the second thing that Lobsang Sangay promised to notably address the grievances of Tibetans from Tibet but in reality, he “discriminately” pushed the problems of people from Tibet aside! Third thing, transfer of 71 Tibetan schools from the Indian government to the Tibetan government in exile. Under the leadership of Dr. Sangay, now these schools which were formerly founded and run by the Indian government are being run and administrated by the exile government. One thing that Tibetan common masses are unable to understand is Sangay’s policy of forcing exile born Tibetan children to join any of these 71 schools, while leaving the most prestigious Tibetan schools like Tibetan Children Village School – empty. Dr. Lobsang Sangay in short sounds nothing more than an empty vessel as we know empty vessel makes the most noise— empty vessels, empty hopes, fake promises. NOTE-- Tendar Tsering is a freelance journalist based in Fridley, Minnesota, U.S.A. Previously he worked with several international news portals including International Business Times. Quite debatable article. However, his leadership with regard to approaching China seems questionable. Tender la, nicely and well-researched piece. I have serious questions as to why he brought CST under direct exile government. What did you contribute?, How much did you contribute in your greenbook. I know only 20% of North American Tibetans pay the greenbook chatrel. He is helpless as he has to deal with people like you. We are not discussing about how much you contribute chatrel but more than that under the leadership of Sikyong how many people took self-immolation inside Tibet. self-immolation comes in Tibet because of China's repression so Sikyong can do nothing in this case other than appreciation their great contribution. This piece to me is an honest observation on the writers part. It reflects deep frustration partly due to sheer complexity of the Tibetan polity and challenges that Tibetan face. It is the duty of the Tibetan Parliament to corner or question the PM and his cabinet. This hasn't been done quite well. Since we don't have opposition party, it falls within the works of Parliament. Our MPs I think need to read this article and ponder. MPs are representative of people, they must ask questions to PM on our behalf after reading this article..
Any policy recommendation would be very helpful rather than just criticism. I know that all Tibetans like you and me are getting desperate and each self immolations are piercing our conscience and our patriotism wants to show itself in action. But blaming Dr. Lobsang Sangay is not the solution. His promises are sincere and like all Tibetans, he is doing his best to solve our tragic case. Dr. Lobsang Sangay is not a miracle worker or a saint, I would like to see what you can do in two and a half years. Tendar: I believe you have written a very incisive, intelligent commentary with regard to Dr. Sangay's place and actions within the government-in-exile. I have seen other critiques about his actions /inactions, suggesting that his view in the future is to "retire" to the U.S. where he has already purchased property. I dismissed those criticisms until now. This time is most critical to the survival of the government in exile, and Tibetans as a whole, as His Holiness the Dalai Lama ages and becomes less able to be proactive with the cause. IMHO, His Holiness still remains as the foundational key: it was he who envisioned a democractically-styled government, but unfortunately that has turned sour with Dr. Sangay's self-involvement. Tendar la, appreciate your timely reminder to us and to Lobsang Sangay! Our society really need reality checks and reminders. We are often carried away by the sweet little things happening around while the bigger goal still lies undisturbed. Tendar la, I found your article very interesting and full of factual information which from my opinion is like a Voice of Voiceless on behalf of an ordinary Tibetans everywhere! In my opinion, Dr. Sangay's political awareness and know how is quite a stereo-type of how Indian Politicians function, too many empty promises and exaggeration in his political campaigns. It seems he forgot that we haven't had our country back yet. On top of that, he took advantage of the lack of political knowledge and understanding amongst the Tibetans in Exile. Most of people reacted too quick to the unheard, educated new young non-bureaucratic background hoping that this can be their solution to find their way back home after so many years in exile. People's hope is hugely disappointed in the process and so did I ! Bodh Gyalo! Long Live Holiness! One more thing.... Canada Immigration is for who? For those who have land and house and family in india? Or for those who don't have anything plus families are facing lot of trouble under Chinese brutal suppression? ??? TG, I think your piece has potential point, why weren't Tibetans born in Tibet even considered under this category? Tibetans born in India got enough benefits from CTA so far and we have also overlooked Tibetans from Tibet. I agree 100%. you try to bring views from all angles. That is what MEDIA is for! I would suggest some recommendations in the future. I know it is not your job to recomment though. It falls on our parliament repts. to have some check and balance. As a Tibetan we should not distinguish between Tibetans from Tibet and Tibetans born in Exile. As for the benefits from CTA, CTA give beneficial to Tibetans who are in need, irrespective of where they have come from. There are so many projects undertaken by CTA to support Tibetans arrived from Tibet. It is good to raise questions if you have any doubts but it might create negative idea in the minds of the public if you comment partially known facts. Thupten Thupten The Tibetan Prime Minister , Dr. Lobsang Sangay is the first Tibetan (among six million) to earn a S.J.D. degree from Harvard Law School and was a recipient of the 2004 Yong K. Kim' 95 Prize of excellence for his dissertation Democracy in Distress. He was democratically elected as the PM of Tibetan Govt in exile in 2011. There have been a number of improvements and achievements during his 2.5 years of office. For the first time in the history of Tibet, a female student got 97 % in All India Senior High School Exams ! He also raised the salary of all the CTA staff members as well as provided more assistance for elderly people's homes. Although many former PMs tried, it is during Losang Sangay's tenure that the Govt of India allowed Tibetans to renew your RC ( Residential Certificate ) only once in 5 years . Arguably he is the first PM to visit most of the remote Tibetan settlements so that there would be a close relationship between his leadership and the common masses. Thanks to our PM Lobsang Sangay la and good luck for whatever you do ! First, for your kind information, that girl scored 95% not 97%, and Sikyong can't claim the credit. If he really want to take, then there are thousands of Tibetan students who graduates every year. Then why only one girl??? There are more then 20000 students who studies and gratutaes from harward so please don't tell me the story of harward we are simple not idiot. If one can't do in two and half years then he can't do it either in 250 years. Please duration does count but so as the intention. Lobsang la is more involved in making his own name in history rather then Tibetan cause. Please look at his cabinet a bunch of Hippocrates,worst politician and confused. We the people like to be entertained and he is doing that all these time so thank you lobsang la and his cabinet for entertainment. Sorry Tibet we still don't have people who really think about you. I find the article little overstated critique to Dr. Lobsang Sangay's promises and achievement. I was not expecting him to bring historical changes but I did expected him to maintain continuity of important policies adopted by former Kashag. He failed miserably to do that, instead he brought more confusion in our on going Basic Education Policy for Tibetan Schools. It appears same policy is followed but much to our discouragement there was 0% moral support from him despite him holding the portfolio of Education Minister. Several key people from the Department of Education who are actively involved in education have resigned, why? I welcome his initiative to increase the scholarship money and hike in payroll of CTA staff but these were bound to happen. Unfortunately, I hate to accept the logic that one female student scoring 97% in All India Senior Secondary Board Examination to his credit, these single achievement has nothing to do with Dr. Lobsnag Sangay being the PM. Extension of R.C. duration and handing over of schools under CTSA to CTA are mere coincidence, our PM got simply lucky. Initiatives to solve these issues were already in place. I think he still has much to prove! The points impressed me from this article is the way L.S gives empty hope to Tibetan inside Tibet and the lack of treatment to the Tibetan born in Tibet but residing in India. These claims are really true if we look closely and these are also very dangerous in future if Tibetan people in Tibet lost their hope then how can we sustain our struggle..
Sikyong did some good work and we have to appreciate them as well. Your article has some bias to some extent but I fully agree with your assessment that Sikyong has send false hope across the Himalayas, causing loss of live through self-immolation. No other leader has made any electorate promise to bring His Holiness the Dalai Lama to Tibet in the exile history. Only if we can investigate the immediate motivation of some of the immolaters, Sikyong might be responsible for generating false hope. Sikyong's other election slogan is 10000 professionals in 20 years. How many do we have? One, two....five? Instead Sikyong is so proud of the girl who scored 95%, as if his one lakh reward is the only motivation for her top. To top with such percentage, she must have worked hard since her elementary. You ask what education policy do our Sikyong have? He will enumerate the number of scholarship he has set up and some gain in CBSE results. When questioned about Basic Education Policy laid down by previous Kashag, he calls the previous Katri himself to head the education council. Yes, there are some achievements and yes there is more needed to be done. I am still not sure the three lists of success he refer is weather his own or the work or the process from previous admins...! Unfortunately, today the politics of Tibetan politicians in Exile is highly based on self profit motives.. !!!! They are more inclined towards their supporter and potential voters..!! Every so called Politicians in Tibetan Parliament should be wake up and do the real thing...U are not a true or entitle to call yourself as politician unless you have your own country..!Doing all this messy stuff in others land will not only make your self shameless but bringing the same shame to the people of the same community !!! Lobsang Sangay, I voted you with the hope you will truly do some thing effective and strong but I doubt now. I don't like people calling you empty vessel, So please do the real things, listen to your self, I am sure you are not truly wasted..Please Do what you really said and will surely support you than...! first of all i dunno who this guy tendar tsering is(sorry fr that).brevity is the soul of wit. in short,stand on our Sikyong place and see what you can do and contribute.its see to comment to write your piece insulting others to fill your stomach..grow up.and contribute to society rather pin pointing which is in our tibetan DNA. a leader is what reflects the masses under him. like mass like leader. a leader can't do anything until his subjects follow and obey him. instead of complaining, we should do our part the best, leave the rest to the hope. So far Dr Lobsang Sangay did very well in different fields,of course as refugee many things will not come as we hope and plan because we are dependent on another independent country whose economic interest is not self- reliance so it takes lots of time to complete our dream so we are better to be united as one body. the question is what is your contribution in Tibet issue? nothing, right? but just pieces of article. The writer's job is to write and comment with facts? Do you even know we have no opposition party unlike other democratic settings? With unity, there is hope, now this nonsense written by some lonely tibetan guy living in fridley, mn, in the midwest, seeking attention, is utterly disgraceful and foolish. For encouraging and promoting disunity in our small community shall i say. Only the foolish imitate the dirty politics that goes on in democratic countries, we should look toward a democracy, such as the one in japan. Not some trash talking mantri from india or corrupt and self enriching politicians that thrive in your neck of the woods, tendar la, you are pathetic. why is this post which call Tendar la pathetic included when my friend told me his post mildly criticising Lobsang Sangey is not posted? Is this another pro CTA blog which pretend to be liberal? If you cant be fair, stop making all these stupid bias blogs, tibet,net should be enough. Hey, I grew up with Tendar la, have spent years with him. Instead of this honest factual article, he could have chosen to write non stop articles to praise Sikyong and CTA or instance another party (we have enough) and take benefits in every possible way like many do today but Tenda la did not. If you are really educated, read the article once again it has more powerful positive messages to Sikyong then the article title. No political leader except His Holiness have this much of powerful influence to the Tibetan people in our history! Analyse the current chain of self-immolation and disasters! We are seeing and dealing with their family members day in and out first hand. Tibetans born and raised in India, I do not think you can imagine overall pain and suffering that we go through in our daily lives. So, don't be dramatic, be rationale, look from all perspectives and comment further. Hey, You all guys, What ever you wrote on wall.. When you do the this position then you will know... ! So far our Sikyong Losang Sangey la did the best what ever he can... ! I thought there might be a fresh idea that contributes to Tibetan freedom struggle and Tibetan unity, but instead found nothing new except mud slinging that does nothing good to anybody and Tibet issue. It is disheartening to read criticism labelled for its name sake that miss the real issue. It is convenient to paint someone in a defamatory language, but it's difficult to recommend any constructive suggestion and solution on how to resolve Tibet issue, how to bring to put an end to self immolation of Tibetans in Tibet today. okay, suppose we accept the writer is right, even then does it serve to stop the pressing crises of self immolation in Tibet? we can not blame on an individual, or the Sikyong for that purpose for all the ills erupting in Tibet. Every devoted and patriotic Tibetan dreams for "return of His Holiness to Tibet". Need of the hour is to support the single political leadership of Tibet in-exile who is democratically elected in a tight contest by Tibetan people. Hats off to you for your brave article. I am really touched with your article which really shows how our Sikyong is "Then and Now". I can see only our Security Kalon and Finance Kalon very worth of calling themselves Kalon. Allow me to write few lines which is very true and then ask yourself "Is Sikyong really doing something for Tibet?" 1) R.C. : Our Sikyong takes all the credit of 5 years R.C. extension to himself which is totally untrue. The credit should goes to previous administration who many times requested Indian Govt. about the extension of R.C. which luckily sanctioned during his tenure. But Sikyong never mentioned Rinpoche and past administrators which is quite shameful and disgraceful. 2) C.S.T. : Hand taking of C.S.T. from CTSA is a long history since from 11th Kashang and last year only Indian Govt. granted the permission. (3) And many more requirement just to work as a junior staff. But what about our New Representative in United States then?? He just entered CTA with special call from Sikyong when he won the election. There are many well worth, well deserve candidates or senior staff in CTA who rendered more than 20 years of services. So it is nothing, but just a partiality of our great Sikyong to whom there is hope specially from our brothers and sisters in Tibet. Please make sure that this man doesn't come again in next election. I find your article very unbias and base on facts. I don't see many journalist like you in our community. Please continue writing. Everyone has the right to express your opinion and write articles about your leader, but calling this article well-researched and unbiased sadly reminds how immature you guys are. So are you going to teach us how to be mature? The above written articles are not only researched ones, but real facts based on truth. If you really saying like this, can you please tell me why he chose Kedor Augatsang as New Representative in Ari Dhonchoe? Isn't that not bias? Why he chose Health Kalon Dr. Wangchuk only because our this health Kalon is a relative of Sikyong's wife? The very same health Kalon who was nearly to get punishment from Dept. of Health before he got selected as New Health Kalon? There are more things to be share, so can you please tell me who is real immature and who researched well based on fact? Sikyong Dr. Lobsang Sangay is a man of principle, and I am sure he has answers to all your above mentioned questions. Instead of just babbling them here, ask for his appointment and talk to him. Besides, dwelling on petty issues, solely blaming it on one person is not the call of situation. Number of people who set themselves on fire are rising day by day. We are losing our brothers and sisters, and above all, human lives. Urgency is in trying to achieve our common and collective motive. Lets look at the bigger picture. We are a lost nation now. We are just 6 million people. Lets work together, and get our country back instead of pulling each other's leg. "calling this article well-researched and unbiased sadly reminds how immature you guys are." I'm sorry to reminds you that. Next time i will try not to be immature as you stated, If you can get to the point or share your knowledge of mature. I heard of the title before and thought there must be some strong arguments buy sadly the piece is not more than some unreasonable babbling of two years kid! Come on guys we are talking a nation here, and please don't tire yourself with self ignorification! How can any rational mind could say this is a well research piece. Comment reminds me of a novice westener Buddhist monk, (inji drapa sarpa) talking about Emptiness (tongpanyid). So next time please spare us with such big title with empty content! Empty vessel in actual is the caption of this read! Speaking of unreasonable babble of a two year old kid, have you by chance read Londen Phuntsok's TIBET -- The Debacle of Salvation? I personally think Doctor Lobsang Sangay has done way better job of representing Tibet than the previous monk Kalon but also what Tendar Tsering writes he backs up with facts which middle way writers hardly touch, instead, they rant and cry, not about china who they think is their friend or kin, but those Tibetans who crave Tibetan Independence. How pathetic is our politics? A nonsensical article written in puerile English !! I dont understand what the writer is harping about by blaming all of Tibet's woes on the Sikyong instead of the Chinese government. Did Lobsang Sangay imposed severe restriction and repression in Tibet or the Chinese govt. So, how can you blame the self-immolations on him? And what's wrong with encouraging hope? Hope is the only thing that have kept us going. Without hope, the Tibetan movement is dead, Tibet is Dead. Hope is good.